Governor Walker Executive Correspondence, 2003-2004. Staff Access Only. Contact the Research Center. 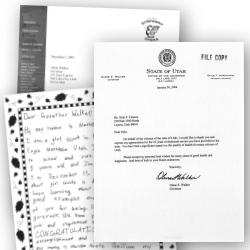 This series contains an assortment of correspondence sent and received during Governor Walker's term. The two folders of incoming correspondence were primarily received from local, state and national leaders corresponding on a wide range of issues that were pressing at that time. This section is arranged chronologically and does not represent all correspondence received by Governor Walker, but rather a majority sample of those for which the Governor read and sent a response. The nineteen remaining folders contain correspondence with state agencies, local government, federal and other state officials, civic and business groups and the general public. 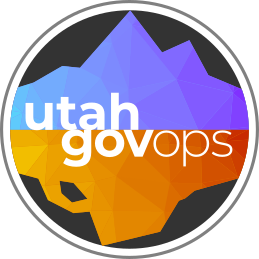 Included are certifications, congratulatory letters, notes of condolence or sympathy, welcome letters to groups meeting in Utah, letters of reference, thank-you letters, letters of support and introduction, invitation letters to civic and business groups, grant and funding requests and congressional and federal agency letters. Page Last Updated March 29, 2010.